Arktikum is a science centre and museum that lets you experience northern nature, culture, and history up close. Housing the University of Lapland’s Arctic Centre and the Regional Museum of Lapland, we stimulate thought, encourage debate, and provide a deeper understanding of the Arctic. See, explore and enjoy the Arctic stories shared through our experiential exhibitions and events! The University of Lapland’s Arctic Centre conducts internationally recognized and multidisciplinary research of the Arctic. The Regional Museum of Lapland is the principal authority on Lappish culture, prehistory, history, architectural heritage, and nature. The Museum Card allows you entry into more than 280 museums throughout Finland; valid for one year beginning on date of first use. Rovaniemi's top cultural attractions in a single ticket! The Culture Pass opens the door to three exceptional culture locations in Rovaniemi. Journey through Lappish history and explore Arctic research at Arktikum, immerse yourself into the contemporary art of the north at Korundi, discover the importance of the northern forest and what powers the bio-economy at Science Centre Pilke. The Culture Pass is valid for 7 days. Arktikum is conveniently located on the north side of highway E4, along the edge of downtown Rovaniemi. lane to continue following signs directing you to Arkitkum. Approaching Rovaniemi on southbound highway E4, take the first exit ramp to the city center. Select the right lane on the exit ramp, and follow the posted road signs as they direct you to Arktikum. View driving and walking routes on Google Maps. Handicapped parking spaces are located in Arktikum’s courtyard. Busses may also leave visitors at the main entrance, but bus parking is specifically marked. Arktikum’s main entrance door is automatic, however, accessibility can be somewhat hampered by the heavy exhibition doors. It is for this reason that we recommend that you have someone to assist you with opening the doors, should you require additional help. Assistants are welcomed and given free admission. Additionally, guide and service dogs are welcome in Arktikum. The first aid room is located in the upper corridor, immediately after the coat racks on the left. Wheelchairs can be found in and borrowed from the first aid room. The first aid room may also be used as a resting room, as needed. Coat racks and lockers are free of charge and can be found in the vicinity of the admission and information desks. Wheelchairs and strollers may be borrowed from the information desk, as well. Elevators are located on both sides of the main corridor; past the information desk and museum shop and before the stairs. Women’s and men’s toilets are located in the upper corridor after the information desk and the museum shop (6 in total), beneath the staircase in the lower corridor (2 in total), as well as in the vicinity of the restaurant and the library (6 in total). Handicapped toilet facilities are located in the upper corridor on the left side of the coat racks. The child care room is located on the right side of the upper corridor, after the information desk, museum shop and coat racks. Strollers can be borrowed from child care room. Prices include a one-hour guided tour, with separately purchased admission. One guide is able to direct a group with a maximum of 30 persons. Guided tours must be booked in advance by contacting us at info@arktikum.fi. Guided tours will be confirmed subject to availability. Rovaniemi school teachers may observe and explore the exhibitions in advance with no admission charge, as they prepare for student visits. Arktikum is a great place to visit for class trips and study tours; providing an abundance of content that can be applied to historical, cultural, Arctic nature and lifestyle study topics. Exhibitions are based on experiences and visualizations provide an inspiring learning environment for students of all ages. In the foregrounds of Arktikum, along the shoreline of the Ounasjoki River, resides an Arctic garden and one of Rovaniemi’s most picturesqe parks. Situated on about seven hectares, and spanning a small island, this arboretum park boasts a scenic location along the banks of the Ounasjoki River. The Arktikum Beach Park displays a variery of species of plants and alpine vegetation that have uniquely adapted to survive the harsh nothern climate of Lapland and the Arctic. The Arctic garden is maintained by the University of Lapland. Additionally, here you will find copies of ancient runestones and runic symbols, as well as sculptor and artist Risto Immonen’s ”Nätti-Jussi”; inspired by the legendary woodcutter and lumberjack Johan Viktor Nätti (1890 - 1964). During the summer months, the midnight sun shines its light on the beach park from the north; making for an ideal spot to enjoy a picnic or go for a refreshing swim. As summer gives way to autumn and winter, along with it comes shorter days and longer nights. It’s during this darker period, Arktikum beach transforms into a stupendous place from which to observe the aurora borealis or northern lights. View different admission options and prices. 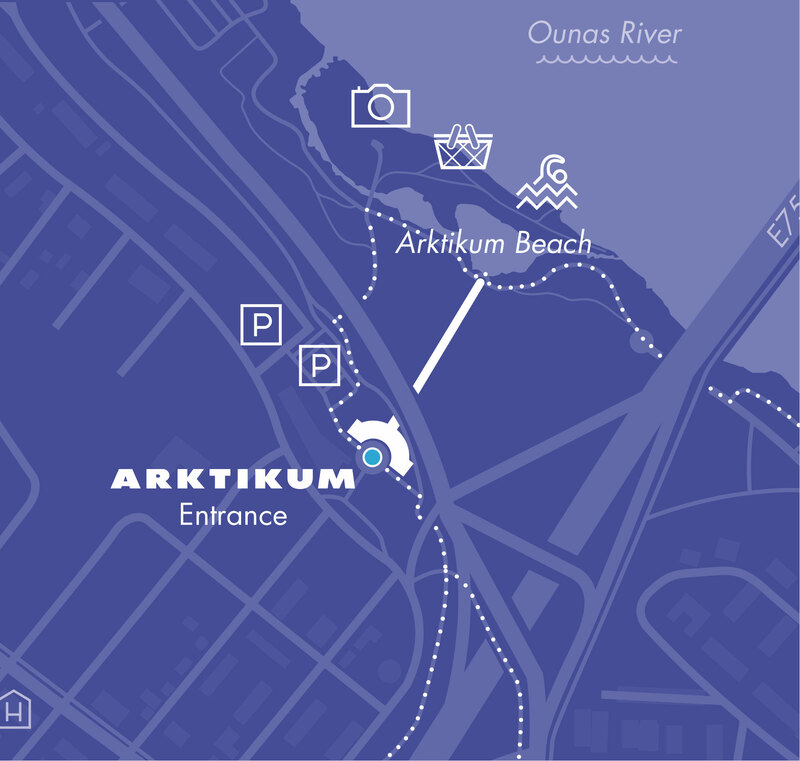 Find the easiest way to Arktikum.